In the prior post, Optimal number of clusters, we looked at methods of selecting number of clusters. 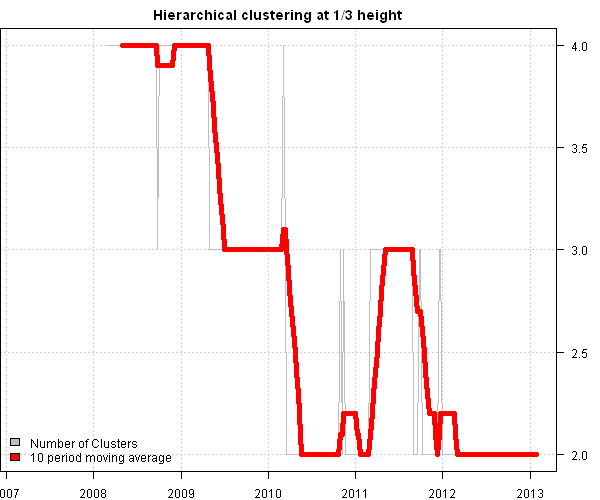 Today, I want to continue with clustering theme and show historical Number of Clusters time series using these methods. To view the complete source code for these functions please have a look at the startegy.r at github. Let’s use these functions on our data set every week with 250 days look-back to compute correlations. 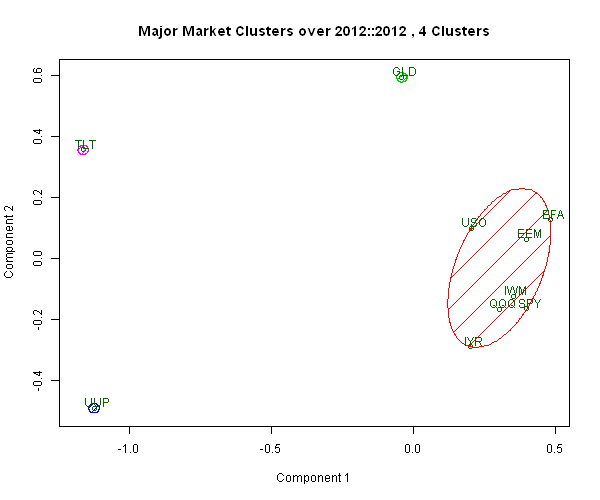 All methods selected clusters a little bit differently, as expected. 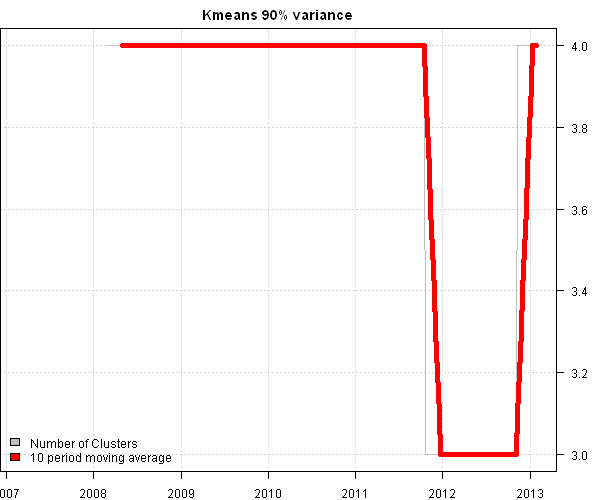 The “Minimum number of clusters that explain at least 90% of variance” method seems to produce the most stable results. I would suggest looking at the larger universe (for example DOW30) and longer period of time (for example 1995-present) to evaluate these methods. Takeaways: As I mentioned in the Optimal number of clusters post, there are many different methods to create clusters, and I have barely scratched the surface. There is also another dimension that I have not explored yet, the distance matrix. Currently, I’m using a correlation matrix as a distance measure to create clusters. I was pointed out by Matt Considine that there is an R interface to the Maximal Information-based Nonparametric Exploration (MINE) metric that can be used as a better measure of correlation. To view the complete source code for this example, please have a look at the bt.cluster.optimal.number.historical.test() function in bt.test.r at github. Michael Johnston at the ETF Database shared a very interesting post with me over the holidays. 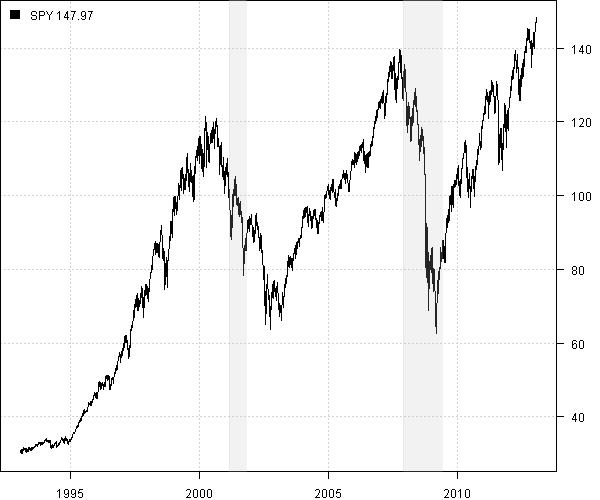 The S&P 500 Visual History – is an interactive post that shows the top 10 components in the S&P 500 each year, going back to 1980. On a different note, Judson Bishop contributed a plota.recession() function to add recession bars to the existing plot. The Recession dates are from National Bureau of Economic Research. Following is a simple example of plota.recession() function. 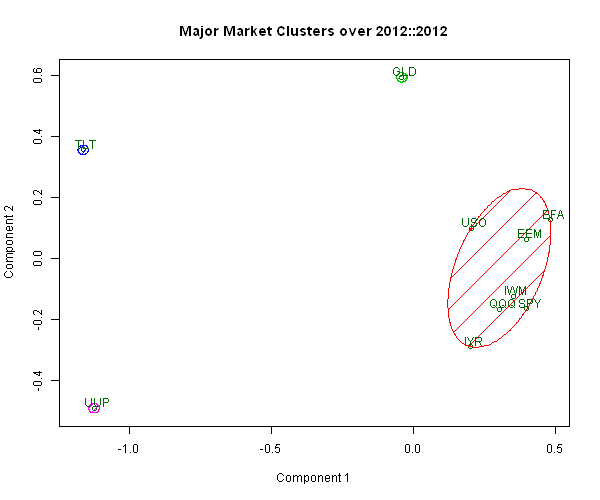 In the last post, Examples of Current Major Market Clusters, we looked at clustering Major Markets into 4 groups based on their correlations in 2012. Today, I want to continue with clustering theme and discuss methods of selecting number of clusters. Next, let’s iterate from 2 clusters to 2/3N clusters (where N is the number of securities) and in each case compute the percentage of variance explained by clusters and minimum correlation among all components in each cluster. In the first method, we set number of clusters equal to the minimum number of clusters that explain at least 90% of variance. This is not a bad choice; the downside is why 90%, why not 75%? In the second method, we set number of clusters equal to the minimum number of clusters such that correlation among all components in each cluster is at least 40%. Also not a bad choice; the downside is why 40%, why not 50%? 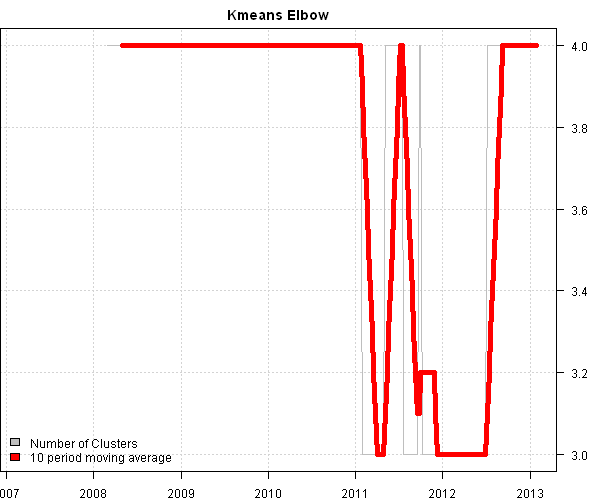 In the third method, we use Elbow method to set number of clusters. The idea behind the Elbow method is to look at the marginal gain of adding each additional cluster. And set the number of clusters equal to the largest K that has positive marginal gain. Geometrically thinking, if you graph the percentage of variance explained by the clusters against the number of clusters, the point on the curve that is farthest from the 45 degree line corresponds the optimal number of clusters. It is a judgment call, what do you think is better 4 or 5 clusters in this case? In the next post I will show the transition of clusters as we move in time. 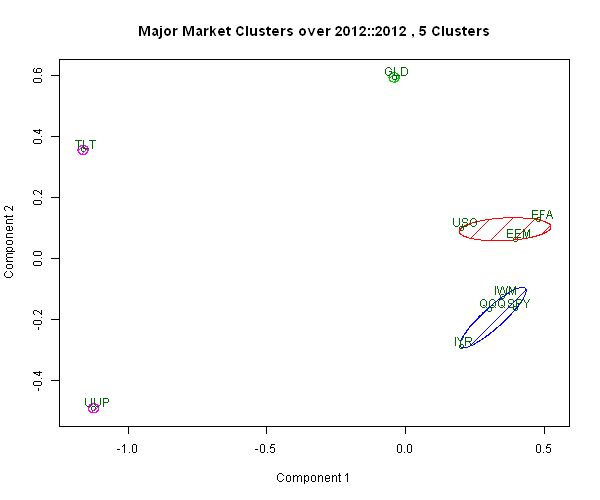 After that I will discuss the Cluster Risk Parity portfolio allocation method (Varadi, Kapler, 2012). For more details about Cluster Risk Parity, please read David’s blog at http://cssanalytics.wordpress.com/. To view the complete source code for this example, please have a look at the bt.cluster.optimal.number.test() function in bt.test.r at github. Today, I want to continue with the Principal Components theme and show how the Principal Component Analysis can be used to build portfolios that are not correlated to the market. Most of the content for this post is based on the excellent article, “Using PCA for spread trading” by Jev Kuznetsov. Let’s start by loading the components of the Dow Jones Industrial Average index over last 5 years. 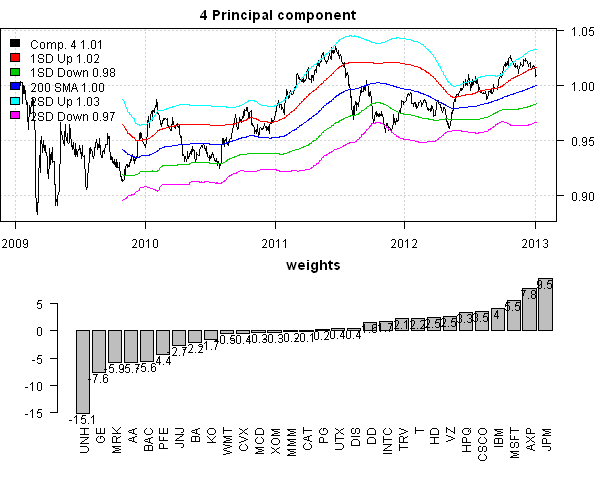 Next let’s compute the Principal Components based on the first year of price history. The price history along with 200 day moving average and 1 and 2 Bollinger Bands are shown on the top pane. The portfolio weights of the 4th principal component are shown on the bottom pane. So now you have a mean-reverting portfolio that is also uncorrelated to the market. There are many ways you can use this infromation. Please share your ideas and suggestions. To view the complete source code for this example, please have a look at the bt.pca.trading.test() function in bt.test.r at github.